Quick post on a new branch of iBrew, very close to the original iBrew. I'm pleased to see that they are branching out again after what happened to the iBrew in Shinbashi which turned into an oyster bar and therefore became pretty redundant for me. I'm not sure if the Shinbashi place has any connection to them still, or whether it's now run by totally different people. However, this place definitely is connected, with staff from the two branches seemingly swapping over all night. So, the new place is literally a stone's throw from the original branch. It must be not more than 25m. A big advantage of this is that if you are planning to visit and one of them is full, you might be lucky and be able to go to the other. The lack of a cover charge also means that on quieter nights you might be able to go to one and then the other, picking off the beers you want to drink from the two menus. Many things about the two locations are very similar, but the big difference with iBrew Wired is that the menu is all imports. When I visited they were mainly US stuff and maybe this will normally be the case, but they also have Italian, Norwegian, Danish and Scottish stuff. You can probably guess the breweries from the countries mentioned as they are the ones you might expect. The US stuff is more from the recent wave of imports. There was quite a lot of Oregon and Washington stuff on. One other notable difference is that the original has a real earthy feel, almost like an old izakaya or ramen shop, whereas the new branch is a bit more slick and modern. I think maybe I prefer the original, but both are nice. On to the similarities. Please refer to the original post here for details. It's an equally small place, nine counter seats and some small standing tables. They have ten taps and the sizes are the same as the original place but the prices are a little higher, regular for ¥490 and large for ¥790 (understandable as these are all imports). Still very good value though. I think that once again you can get Brewdog beers cheaper here than in the ridiculously priced Brewdog bar. The food menu seems to be pretty similar to the original (if it ain't broke, don't fix it). The front of the bar opens out onto a small area of greenery which was nice until some smokers turned up as the small front patio (if you can call it that) is a smoking area. Given the size of the place, this pretty much means that it's a smoking bar with the doors open, so if you don't like smoking it might not be good for you. [Visited last week and as it's now Autumn/Winter, the front patio is closed off and the bar is no-smoking. Not sure if this is the same in summer though]. Two final similarities. There's no cover charge and the listed prices don't include tax which is added on your bill, so take that into consideration if your budget is tight. All in all, this is a welcome addition to the Tokyo scene. Many people seem to love import beers and many more people love cheap beers so this combines the both of those. I think I will probably visit the original more, but plenty of people will probably disagree with me (they usually do). The prices are good and they always have their taplist on their facebook page so you can turn up well prepared. Well worth a visit. None, but that's the point of this place. For simplicity, if you are standing looking at the front of the original iBrew. Turn to your right, and the new branch is straight ahead of you across the road. The map shows the route from Kyobashi station, exit 5, as the post for the original shows the way from Ginza Itchome. All bases covered. 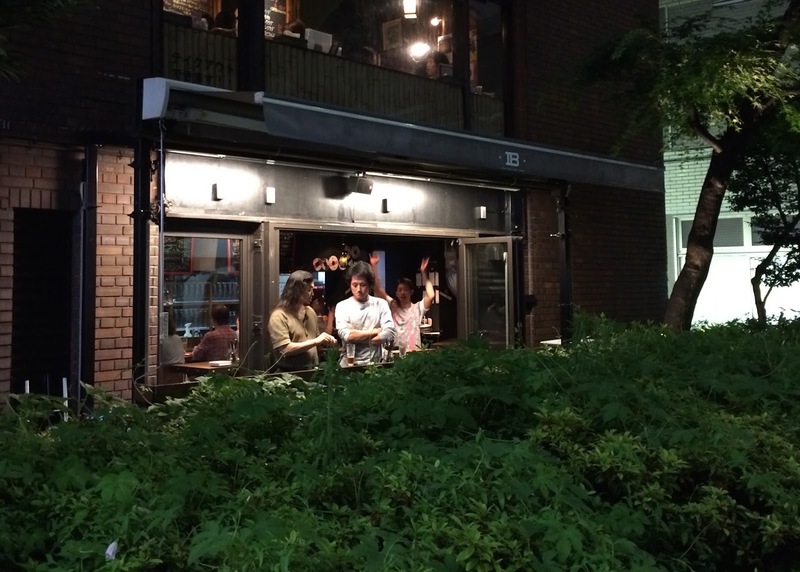 One of my favourite craft beer bars in Tokyo. Very accessible and relaxing place to imbibe. The new iBrew is one of your favourites or the original one? I like the new one, but definitely prefer the original. I'll have to check this place out when I can get over to Mainland!